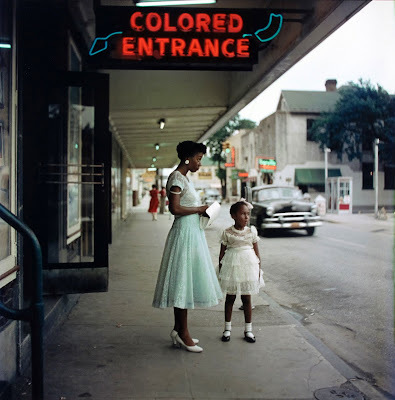 The two images above are included in a Limited Edition Portfolio of 12 color photographs taken by Gordon Parks for a 1956 Life Magazine photo-essay, The Restraints: Open and Hidden. 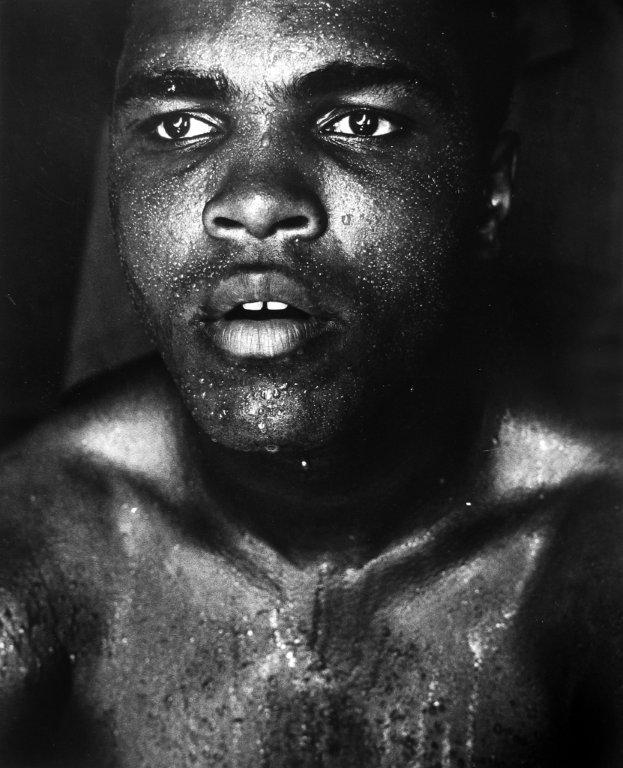 The set of twelve 16 x 20" images is printed in a limited edition of twelve numbered sets released in a Portfolio published by the Gordon Parks Foundation, available from the Howard Greenberg Gallery. 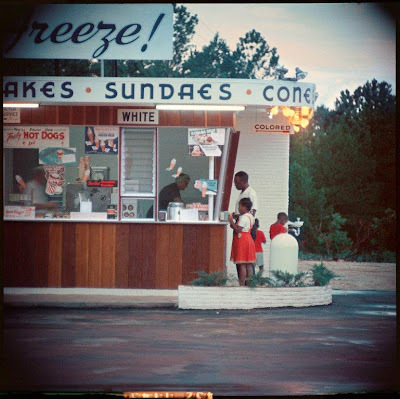 The color photograph, Untitled, Shady Grove, Alabama, 1956, of a family waiting in front of an ice cream shop on a hot summer day, is on view for the first time as part of the "Segregation Story" series taken for Life Magazine. 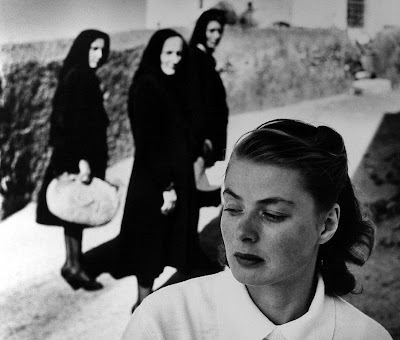 "Gordon Parks is the most important black photographer in the History of Photojournalism. Long after the events that he photographed have been forgotten, his images will remain with us, testaments to the genius of his art, transcending time, place and subject matter.”– Harvard Professor Henry Louis Gates, Jr.
Gordon Parks, born into poverty and segregation on a farm in Kansas in 1912, was the youngest of 15 children. He worked at odd jobs before buying a camera at a pawnshop in 1938 and training himself to become a photographer. 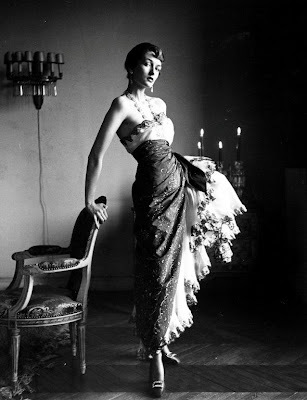 Parks was a photographer at the Farm Security Administration and later at the Office of War Information in Washington D.C. from 1941 to 1945. As a freelance photographer, his 1948 photo essay on the life of a Harlem gang leader won him widespread acclaim and a position from 1948 to 1972 as the first black staff photographer and writer for Life Magazine, the largest circulation picture publication of its day. He was also a noted composer and author, and in 1969, became the first African American to write and direct a Hollywood feature film, The Learning Tree, based on his bestselling novel of the same name. This was followed in 1971 by the hugely successful motion picture, Shaft. Parks was the recipient of numerous awards, including the National Medal of Arts in 1988 and over 50 honorary doctorates. Parks died in 2006 at the age of 93. In honor of the 100th Anniversary of the birth of Gordon Parks, the Howard Greenberg Gallery in collaboration with the Gordon Parks Foundation will present two simultaneous exhibitions of his work. Contact: Gordon Parks, Ralph Ellison, and “Invisible Man” curated by Glenn Ligon and Gordon Parks: Centennial, which includes nearly 40 works spanning five decades of the artist’s career beginning in the early 1940s, including some of the legendary photographer’s most seminal images. 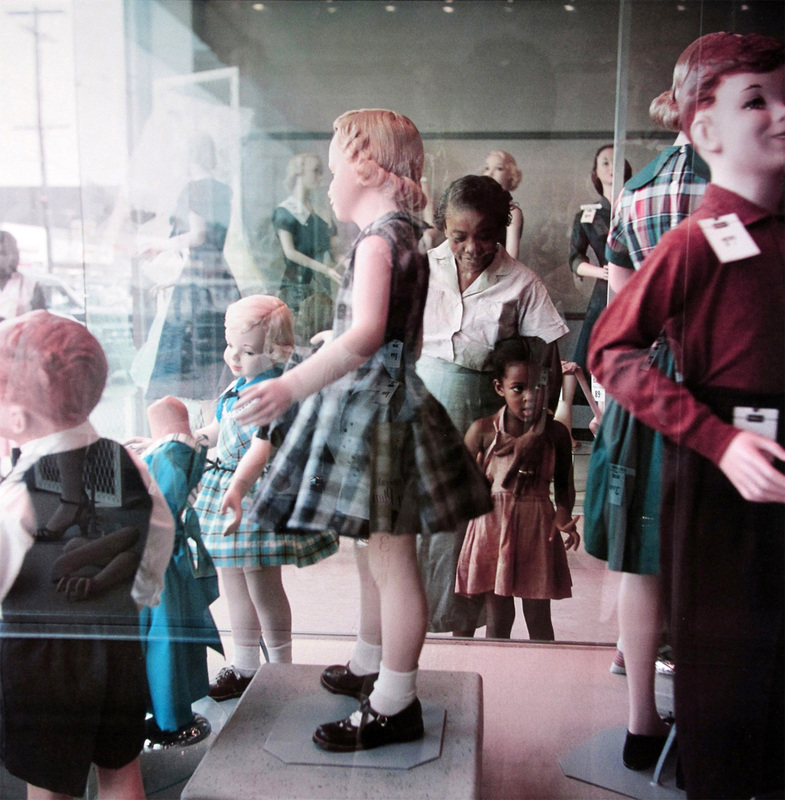 Most noteworthy in the exhibitions will be a number of color prints from Segregation Story, 1956. 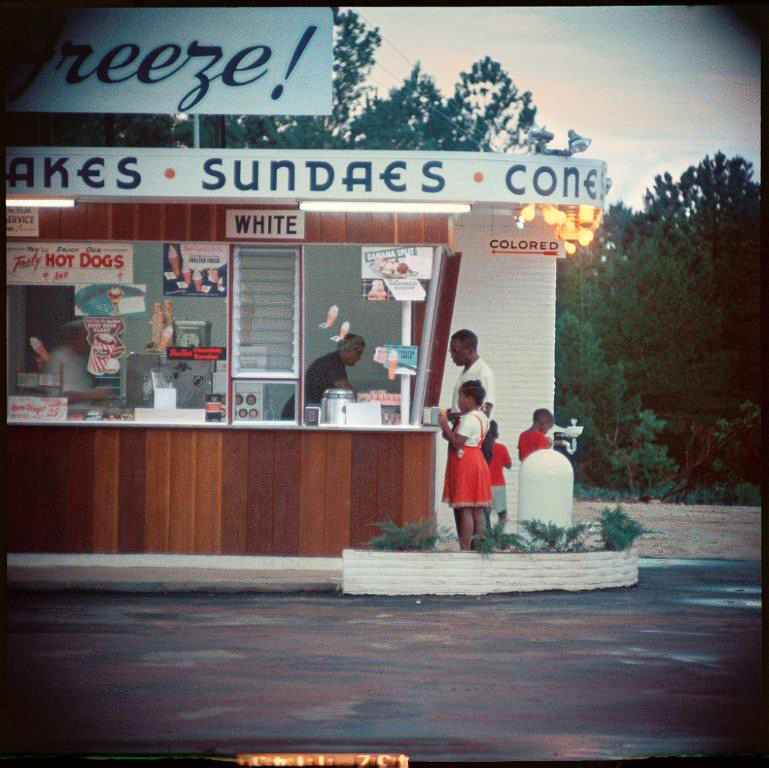 The exhibitions will coincide with Gordon Parks Collected Works, a five-volume book on his photographs. (Steidl, 2012). 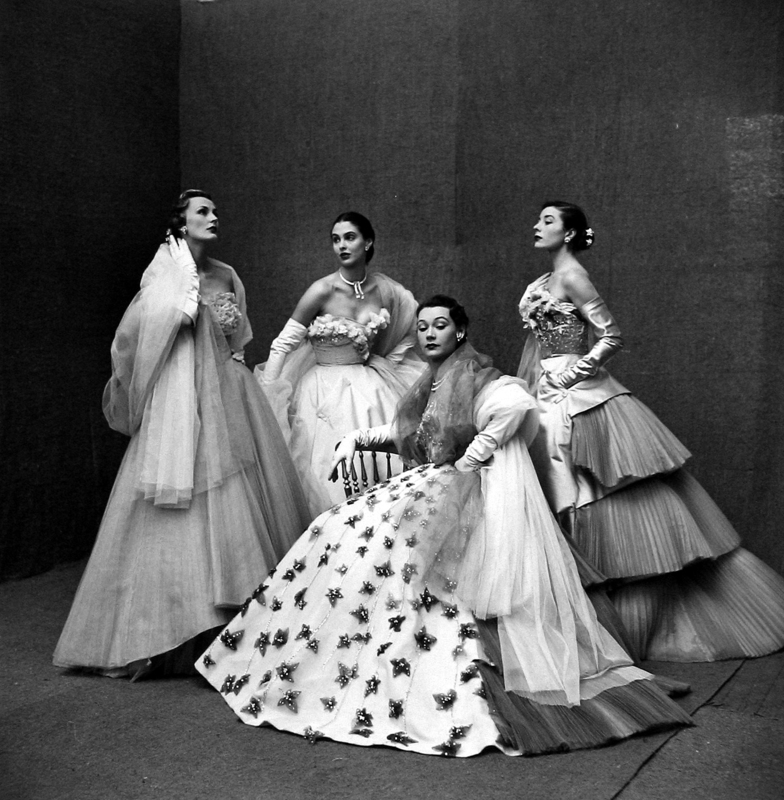 The book will be the most extensive publication to document Gordon Parks’s legendary career. "An Interview with Howard Greenberg"
The Gordon Parks Foundation permanently preserves the work of Gordon Parks, makes it available to the public through exhibitions, books, and electronic media, and supports artistic and educational activities that advance what Gordon described as "the common search for a better life and a better world." The Foundation is a division of the Meserve-Kunhardt Foundation. A number of other exhibitions in New York will coincide with the exhibition at Howard Greenberg Gallery including Gordon Parks: 100 Years at the International Center for Photography through January 6, 2013; Gordon Parks: 100 Moments at the Schomburg Center for Research in Black Culture through December 1, 2012; Gordon Parks: Crossroads at the Tisch School of the Arts, Gulf+Western Gallery, from September 4 through September 25, 2012; and Gordon Parks: A Harlem Family 1967 at the Studio Museum of Harlem from November 7, 2012 through February 2013. I saw a very fine Gordon Parks exhibition at The Saint Louis Art Museum - my first introduction to Mr. Parks. Very powerful images. One of my all time favorites. I got a chill every time I got to meet him. An incredible artist and an amazing life. A for-sure show to see. I hope to see this, remarkably beautiful and tragic in one breath. I have sent a thank you to Carla for introducing me to your blog ! He was a man of few words, but he always listened intently; observing & listening. I met him 3 times. The oddest was after hee presented his work to the annual "Seminar" all the Nat'l Geographic photographers, in Washington in the early 1980's. At the end of his hour-long presentation of his work, there was stunned silence. He stood there looking at hundreds of top photographers & editors, and they sat there in the semi-darkness lookinng back. After about * very long 30sec or so, the hall roared with applause. Even afterward, I watched dozens of photographers come up to him, shake his hand and say nothing. He'd humbled a whole auditorium of the top documentary shooters.